I normally don’t blog on days beginning with “T” but I woke up this morning to a notice from my friend K.O. 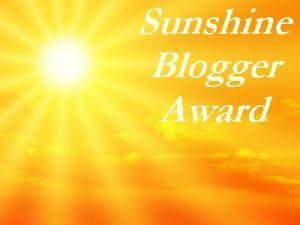 over at “This is the Crafty One” to discover she’d nominated me for the Sunshine Blogger Award! She runs a fabulous craft blog complete with cross stitch patterns she’s designed herself, cards, and scrapbook pages so if you haven’t been over there yet, you should click the link and check out what she can do. Include the award logo in a post or somewhere on your blog. I can’t really think of 10 questions on my own to answer, so I’m just going to use the ones K.O. answered in her post. What is your favorite thing to do when you have time for you? I love reading books and I’m fairly sure my reading list will never end no matter how much free time I have in my life, I also love to write, and of course cross-stitching as well. I also like watching movies and TV shows while stitching, so that’s like getting two hobbies in one. What is your favorite memory from your childhood? My absolute favorite childhood memory is being allowed to stay up late with my dad on nights Star Trek: The Next Generation was on. We’d sit in front of the TV and eat mint-chip ice cream. I felt so cool. If you could meet one famous person who would it be? And why? That’s a tough one. I guess I’d have to say Charles Dickens because I’ve spent a lot of time reading Victorian literature and writing papers over “Great Expectations”. It’d be nice to get some facts from the source. Were you named after anyone? Why? I was named after Mother Teresa because my mom wanted me to be named after a strong woman who did great things. It was between Mother Teresa and Margaret Thatcher but Teresa won out because we are Catholic but not British. Share a memory of something you got up to in your 20′s. Well, I’m still in my 20s so that’s a tough one. I guess graduating from college will be the biggest one, so I’ll go with that. What is your favorite song? Why? I couldn’t think of one so I looked on my itunes for my most played song, which is “Breakfast After Ten” by Blue October so I think I’ll go with that one. Are you married? Single? Kids? No kids? Pets? This is a lot of questions all in one so I’ll just answer it with a resounding I’m happy. How many different places have you lived at in your life? Just one house, 3 different apartment/dorms, and 2 different cities. Now for the exciting part….my 10 nominees . I know it says I’m supposed to go comment on their blogs, but I’m just going to link to them here and they can decide whether or not they want to follow through with the rest of it. Some people enjoy blog awards (like me) and some people think they’re a little spammy, so I’ll leave it up to you whether or not you want to pass it on. A Detailed House for DIY around the house projects. Peace, Love, and Fabulous Things who I love and who always has ideas for around the house as well as her own fabulous paintings. Pin Cushions and Reflections who gardens, sews, stitches, and everything in between. More Quirky Than Crafty who I just love. Her blog is fabulous. Check it out. Vix Knits who does a lot more than just knit. A Stitcher’s Stitching who I just started following recently but her blog is great. CoCo J. Ginger, who isn’t a crafter at all but writes some great poetry. Hardcovers and Heroines a blog about books which I look forward to everyday.